Photo of Evan Longoria courtesy of Kelly O'Connor/sittingstill.net and used with permission. I promised myself I wouldn’t write about this because it seems that every year I write at least one entry about being a woman sports fan. I don’t like to identify myself a solely a female fan because of the ideas that conjures. Many people assume it means you follow sports because the guys are cute but don’t really know anything about the sports you follow. Every year I write an entry or two and every year I explain that while I do often find athletes attractive the attraction isn’t strong enough to sustain my being a fan. I think over the years I’ve proven that I know about baseball (and other sports) AND appreciate the men who play. So I promised myself I wouldn’t get into this even before the season starts. I’d really had enough of the whole sexist thing while I was at WEEI,com (not from the people I worked with, just the audience I got when I went over there.) and didn’t want to re-visit it this soon. But yesterday over at “Big League Stew” they posted a photo and an accompanying blurb that started a bit of a heated discussion online about sexism as it relates to sports and how women fans are viewed. Rochie goes on to write that they opted for surgery over a scope because the recovery time is shorter. Which means, ultimately, that JD Drew showed up at camp in hopefully better shape and fully ready to go for the new season. This, of course, won’t prevent the stories popping up in the blogosphere about how awful JD Drew is nor will it mean and end to the “Drew isn’t worth his contract” pieces that crop up every season. To me what it means is that Drew conducts his life the same whether it’s during the season or not, which is to say he’s private and quiet and jut does what needs to be done and tries to do so without drawing much attention to himself. A healthy, spur-less, JD coming into Spring Training makes me very, very happy. An unrelated note: Over at MLB.com, Kyle Snyder is listed as a non-roster invitee – but not for a specific team. I worry that 2009 might have been the last time we got to see Kyle play professional ball but I hope that there is still a team for him given that Spring Training only just started. Positive vibes being sent Kyle’s way. Here’s hoping for good news soon. And a brief mention because I’d be remiss if I let the day pass without writing this: Happy birthday to both Mike Lowell and Bronson Arroyo! Aside from their birthdays they don’t have much in common except each has a World Series ring from the Red Sox but they’re certainly two huge fan favorites. Good things for both of them in 2010 is my hope. For Mike, I hope that includes still being in a Red Sox uniform come April 4th! I’m currently watching close-ups of Daniel Bard and John Lackey on NESN warming up in Ft Myers. It’s reminiscent of getting to see warm-ups and BP when you go watch the team play on the road and suddenly it truly hits me that Spring Training is upon us and April 4th will be here sooner than I think! And it really does look like mid-September in Baltimore given all these pitchers are in long sleeves or even sweatshirts. According to weather.com it’s 58 degrees there at 9:45 this morning (which is balmy in Boston!). Tom Caron and Peter Gammons are talking over the footage of the pitchers (hey there’s Tim Wakefield!!) and are pretty much just telling us things we’ve already heard – but it doesn’t matter, does it? They’re talking about baseball, we’re watching baseball players in uniform doing baseball player-type things (Wakefield next to Papelbon both stretching with as little effort as they can muster is entertaining) and all looks hopeful for 2010. Peter Gammons seems to be a tremendous Tim Wakefield fan. “Buchholz might have to wait his turn”, he just said. I’ve been critical of Gammons (and stand by my criticisms, especially in regard to his interview with Alex Rodriguez last year) but the one thing I like about him that others always criticize him for is that he isn’t afraid to admit what a baseball fan he is. I think, for the most part, I’m going to enjoy him being on NESN this season. NESN is going to commercial with the highlights from the Sox/Yanks games in 2009. Again, this station knows their audience! Fans want to see their team and hear what’s going on with them. NESN is feeding our need for Red Sox baseball and I won’t be complaining about that. Screen grab from WBZ footage - 99 questions about how much Clay weighs. Even though we’ve been getting “reports from the Fort” all week (including sound bites from and cell phone photos of, well, pitchers and catchers) today is the official reporting day for pitchers and catchers. Baseball is finally here! Sort of. Spring Training is an odd time for me as a fan. I love seeing all the guys show up and ready to work and I enjoy finding out about the new kids on the block and getting an idea of what we’re going to see in Pawtucket and Portland and Lowell. But I always find it difficult to get truly amped up over Spring Training games – admittedly I think I enjoyed NESN’s coverage of the workouts more than I did some of the games. I just prefer the games to have genuine meaning once they’re over. So as much as I’m thrilled, and I am truly thrilled, that Spring Training is finally upon us, I’m really still just counting the days until April 4th. Doesn’t mean I won’t be enjoying all the local media has to offer in regard to coverage, though. Right now, I have to tip my hat to Peter Abraham over at boston.com (I know. No one is more surprised than I am that I’m sending you all over there!). His updates on the Extra Bases blog have been interesting, peppered with photos, and pretty much snark-free. He’s been a joy to read this week. I hope it lasts. 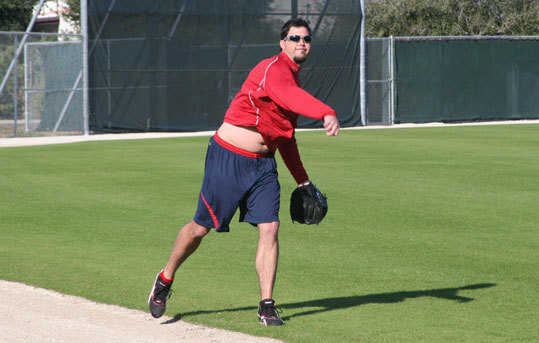 This week we’ve learned that Clay Buchholz has put on weight, we got the annual “Josh Beckett has a belly” photo (notices the asses at boston.com use the word “gut” to name that file) along with our first look at some of Boof Bonser’s tattoos. It was reiterated that Tim Wakefield plans to be a starter and Terry Francona is already planning on how to handle the old guys (in Lowell and Wakefield) who probably won’t be as useful to him as they once were. We also found out that Daniel Bard wants to be the closer some day and that the geniuses in New York took this to mean that Jonathan Papelbon will be pitching in pinstripes soon. 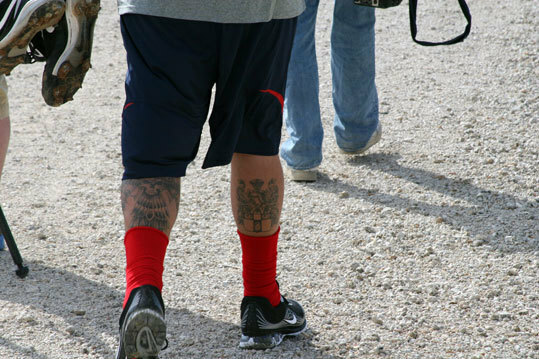 We also learned that Cinco Ocho obsessed on how the Sox left the playoffs in 2009 as much as any fan did. It’s only February 18th and we’re already gearing up for drama all through Spring Training. To get you in the mood, NESN is airing 3 games from the 2009 season today from 1pm-7pm leading into their 7 o’clock Spring Training coverage. We get the April 24th, walk-off win against the Yankees (probably the best game I attended all season, which is telling in regard to the season, huh?) at 1pm. At 3pm they’re showing the Nick Green walk-off game against the Braves from June 21st and then at 5pm it’s the August 14th game against the Rangers where Clay Buchholz got thrown out at home but a six run ninth inning helped us forget that. Three games that were nail-biting, head-banging, breaking things around the house exciting. Enjoy them while you can watch games that we know the outcome ahead of time! Soon we’ll be biting our nails again for real. MLB.com has taken to publishing clips from NESN’s “Red Sox Report” lately and if you keep checking in there you’ll find some nuggets of joy. Take, for example, their two video segment on Tim Wakefield and his ongoing support of the Space Coast Early Intervention Center in Melbourne Florida and the golf tournament he holds yearly to help support the Center. It’s ten minutes of warm, good feelings with few cameos (Jim Rice, John Farrell to name two) and it’s just another reminder of what a good guy Tim is and how much of his life he dedicates to charity. Screengrabs from the videos. What he said while showing the camera the golf ball: "Representing!" Don’t be calling him “old”. He frosts his tips and uses words like “representing” yo. Loading stuff onto a truck in the freezing cold. Seriously, that's all it is. This coming Friday is Truck Day. Still a mystery to a legion of baseball fans, it’s practically a holiday in Boston. There has been a huge detachment for me from baseball this off-season. I tried fueling the desire with the usual activities of the off-season: the New Stars for Young Stars annual event at Jillian’s, the Hot Stove round table at Fenway, the Hot Stove, Cool Music concert at The House of Blues and the Hot Stove party at McCoy Stadium, . all were lots of fun but none really gave me that feeling of baseball being right around the corner. Which isn’t to say I’m not excited about the season approaching. One of my friends posted this morning on his Facebook profile that there are only 11 days until pitchers and catchers report – and suddenly I started getting that feeling of excitement. That winter would be over soon and we’d be watching our boys playing the game we all love. And now I’m desperate for it to get here! I’m never one who wishes time away and I often chastise others who do so, but I’d be lying if I didn’t admit that the sooner next Friday gets here (and by extension, p&c reporting) the happier I’ll be! I’ve mentioned to more than one person this week that I had NO plans for next Friday other than to be standing in the cold out by Fenway Park watching them load equipment on to the trucks. Most people who know me get this but I’ve made a few acquaintances over the last year who aren’t fully aware of my passion. Or, as one of them said to me, “How stupid do you have to be to stand out in the cold and watch trucks drive away?”.